The reason I have been incommunicado is that I have had a long holiday communing with nature and catching up with old friends. 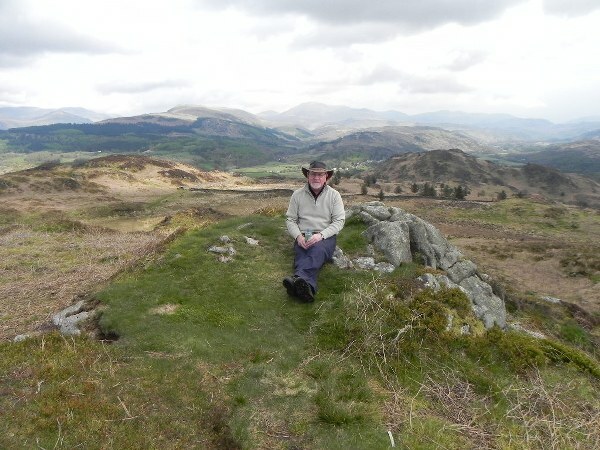 The BC and I went to the Lake district which is not normally a sensible thing to do in April considering April is known for showers and The lake District for deluges at the best of times. Strangely some of the South West sunshine must have accompanied us as we had a very pleasant week. The cottage was a bit quaint for my liking. Wood burners may be very rustic but they are a touch lung unfriendly. I am also not sure I really want all my clothes to smell of wood smoke. It is not a perfume Christian Dior is likely to be marketing soon. Luckily I had quilts in the car so I was able to curl up and be cosy warm despite temperatures lower than those I am used to. The BC didn’t use his so presumably I have been living soft. 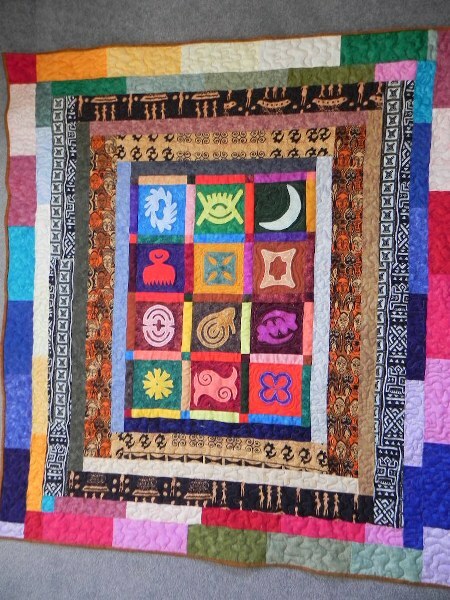 Here is the quilt itself. Again it is one of my early ones and very fiddly so the piecing isn’t perfect but it works on a keeping warm level. I think it was before rotary cutters took off and each piece was individually cut out and stitched together. 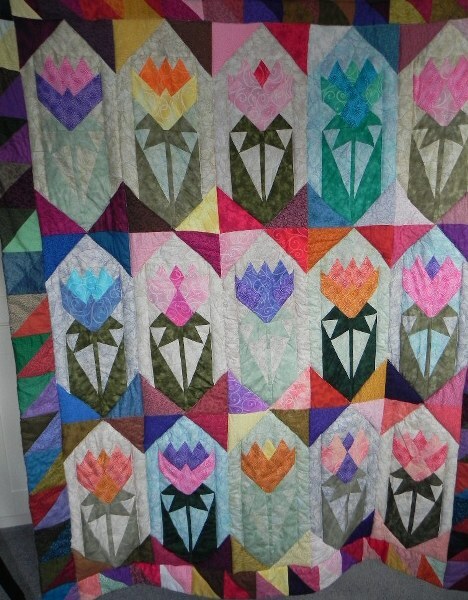 I believe there are easier ways to do this type of quilt now but I haven’t investigated that branch of piecing as yet. I am fast coming to the conclusion that life is not long enough to fit in the essentials never mind the rest. 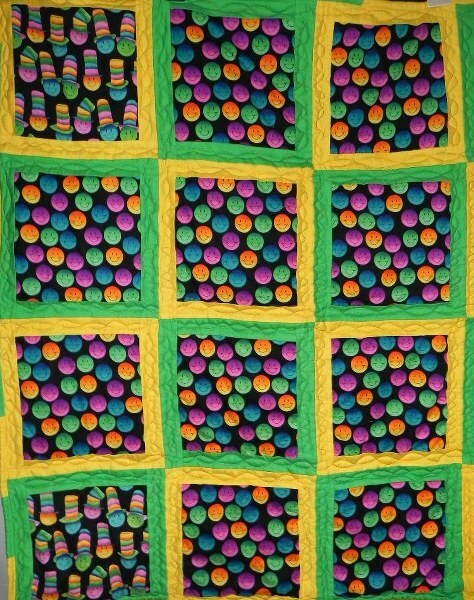 The original pattern is ‘Judy’s Flower Patch’ by Judy Martin. It comes from the book ‘Scrap Quilts’ by her. 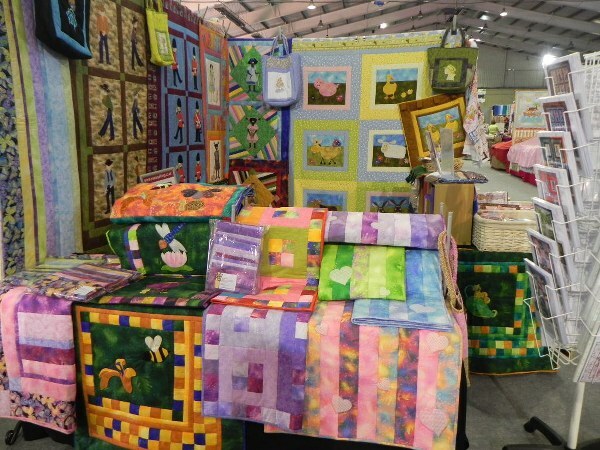 The one in the book is a lovely double quilt. 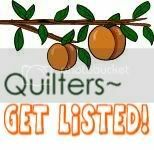 I made mine into a quillow as it is kept in the car and folds up into a pillow when not in use. Here is the one the BC didn’t use but I still had to wash to get rid of the smokey smell. Simple but cheerful. (The quilt not the BC). In case you don’t know what The Lake District looks like this is pretty much it. Some strange person seems to have crept into the picture. Do they have Leprechauns in The Lakes? Looking a little closer, could it be a gnome? I have also just noticed that there isn’t actually a lake in the picture. This is because even in a district called The Lakes they are not everywhere. I believe this type of country is known as a Fell. Certainly didn’t do my feet a lot of good but I didn’t actually fall. The only problem was that BCs map reading seems to have gone off a bit over the last few years. I think we got lost just about every day. We even ended up climbing over a rather rickety looking dry stone wall at one point. Interesting but something perhaps better tackled a few years ago. Anyway, we survived the experience. The next time we got lost it was an erronious input into the satnav. Garbage in, garbage out as they are wont to say. After the week in The Lakes the BC arranged to do a mystery tour via old friends. (I think he was trying to put a bit of excitement into my life). I was a bit worried I might not recognise any of them but it didn’t happen so that was alright. I quite enjoyed catching up with people. It is amazing how many years pass unnoticed. It’s actually quite scary. I even visited one of my aunts and she is 102 and still cutting her own lawn and going shopping. There is hope for me yet as long as I inherited some of those genes. 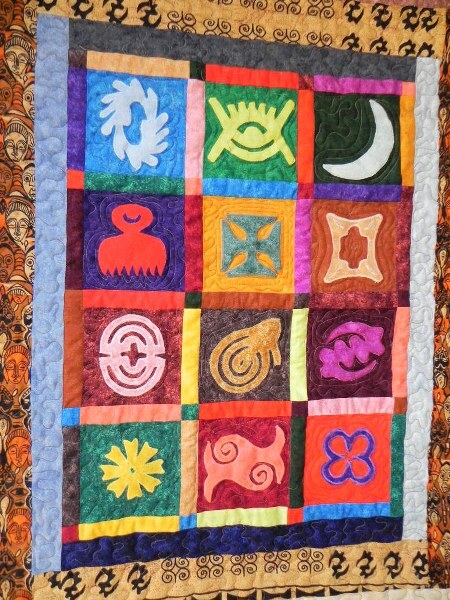 This one shows ghanian adinkra symbols. Each symbol has a meaning and they are woven into cloth to create a message for the wearer and maybe also the observer. Many moons ago I spent some time in Ghana so I feel an affinity. It was the first time I had travelled to Africa and everything was new and interesting. After many years things that once seemed new and exciting become mundane and everyday. 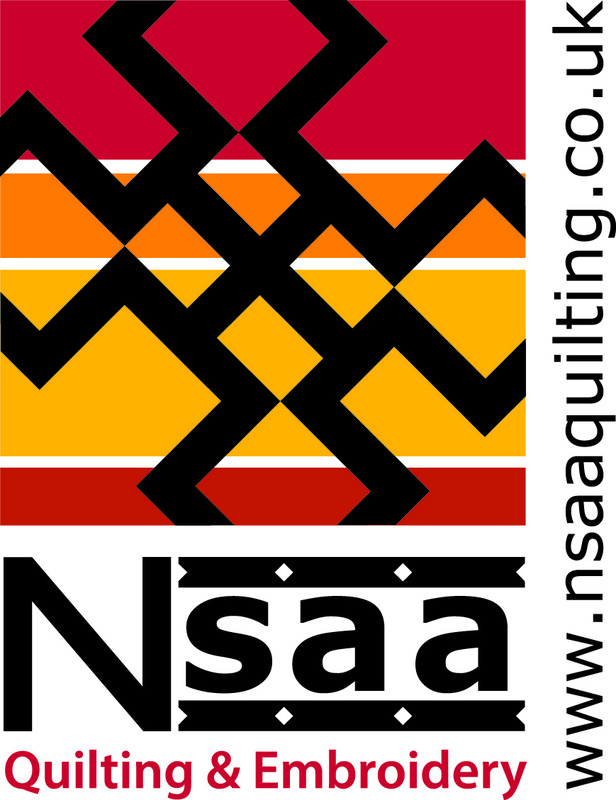 The name of my online quilt business is Nsaa which, in the adinkra symbols is a fabric. Basically the symbol means that something is genuine and of superior quality. It also makes a rather good logo. If you are interested in what the rest mean click on the link above to take you to a page about them or just Google ‘adinkra’. 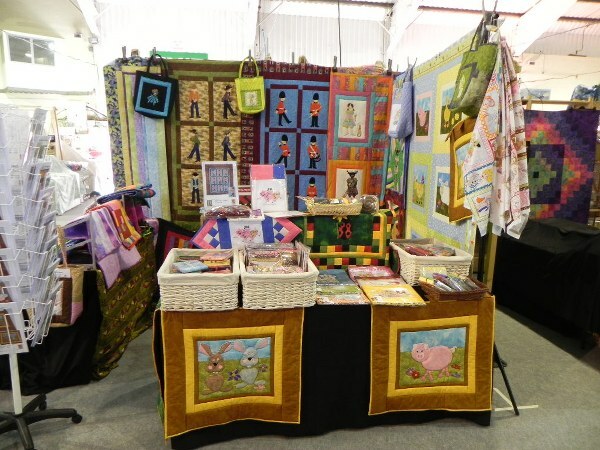 This last weekend I took a stall at the Westpoint Spring quilt festival in Exeter. It was great fun although the people who make a living at craft fairs and had to pay for petrol and accommodation were not too pleased. The number of people was definitely down from the couple of times I have visited as a customer and those that were there were not buying much. However, I picked up a few tips on future fair strategy. A lot of the traders do the whole circuit so they know each other and have a bit of a get together as well as selling. This is what we looked like. I think I might have less on show next time but it’s all a learning curve. Now I just have to unpack all the boxes.